The Gower coastline plays host to stunning scenery, an abundance of wildlife and some of the best walking routes around. With so many different walks, paths and routes available to take throughout Gower, there’s something for everyone. Here are five of our favourites. One of the most commonly walked routes on the Gower Coastal path, the path begins at Langland Brasserie and curves around Langland Bay golf course, offering spectacular views out across the bay. The route finishes at Caswell where you can stop and enjoy another of Gower’s most popular beaches. This route allows you to reach the highest point in Gower, view the famous Worm’s head and take a walk across one of the world’s best beaches all in an afternoon’s work. This four-mile walk begins at Southgate and stretches along the South Gower coast finishing up at the shingle bay of Pwll Du. Keep an eye out for the rare plants, such as yellow whitland grass, that flourish along the route in the limestone grassland. 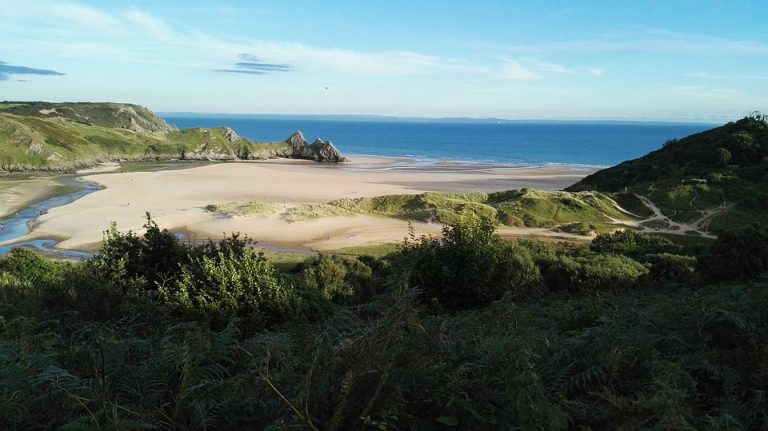 Traditionally this walk begins in Penmaen and explores sand dunes, salt marshes and woodland areas and the magnificent site of the three cliffs make any walk here worth its while. Expect to walk near to the herds of cows grazing the marshes next to Pennard Pill stream, which flows effortlessly in to the sea. Last but not least is the Mumbles circular route. Beginning at Oystermouth Castle you head along the Mumbles coastline and can take a midway break at the Mumbles Pier. From the Pier you continue passed Bracelet and Limestone Bay before ending up at Langland.